This series receives Satoshi’s silly saturn suit seal of approval. 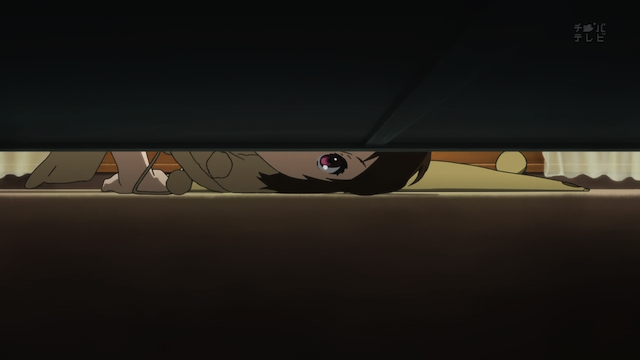 For me, Hyouka is the undisputed series of Summer 2012. I am enjoying a couple of other shows, but this is a series that really feels like it is raising the bar. It has been obvious from before the series aired that it would be visually excellent, and even that turned out to be an understatement, but what I really find impressive is the way Hyouka is succeeding with character development and its exploration of the Mystery genre. Add back in the unrivaled animation abilities of production company KyoAni, and you have one of the greatest shows of 2012 at the very least. This post is mostly a reaction to the third arc of the series (episodes 12 – 17), but my interest here is less the events, and more the bigger picture. The Kanya Festival turned out to be yet another opportunity for KyoAni to show off their artistic chops. In some ways the whole series has been building up to this arc. The very first arc involved a terrible secret related to the Kanya festival, and the Classics club’s attempt to produce an anthology to sell at the festival. The second arc was about the Classics club rescuing another group’s project for the same festival. It should be obvious that Kyoto Animation would take advantage of the spectacle of the cultural festival to demonstrate their unparalleled animation skills, but equally impressive was their directorial style. 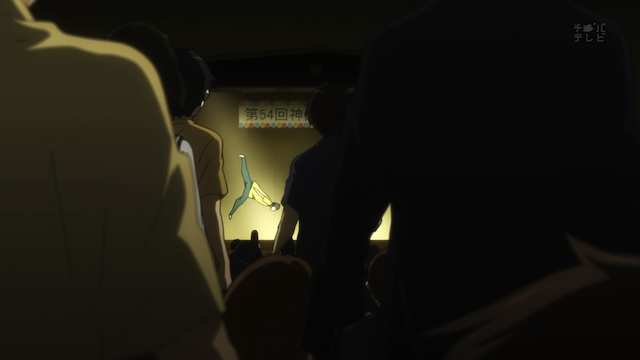 In the screencap above, a lively dance performance is animated with the polish KyoAni is perhaps uniquely able to deliver. The excitement in the room, however is conveyed, as people in the audience start standing up — blocking the viewers perspective on stage. The effect is to give one a sense of really being in the room. Eru Chitanda is feeling overwhelmed. 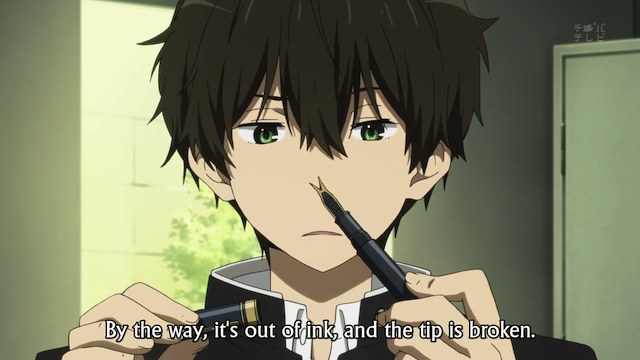 After watching Hyouka, every other anime feels like it was drawn by kindergarteners. Mayaka Ibara searches for a masterpiece. 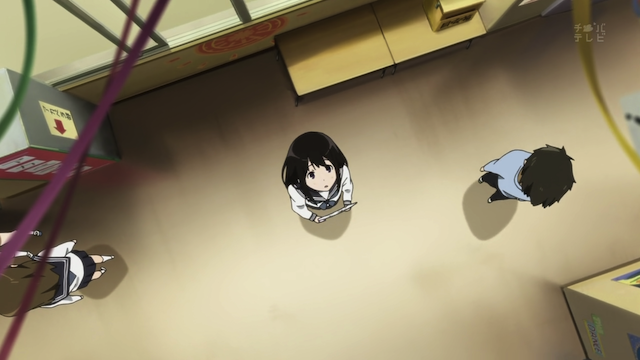 Hyouka’s first two arcs were mysteries that mostly took place in what seemed to be a very limited physical area. In fact, the first arc saw the Classics club traveling to Chitanda’s house, and had some notable scenes that took place outdoors, but most of the story has been the Classics club talking amongst themselves. The third arc really broke that open. The club members are split apart, and we watch as they interact with other people, without Classics club members to back them up. This does a great job at developing their characters. “Character development” is often used in two different ways. Here I mean both. Character development can be used to mean “growth”, as in the character changes as a result of their experiences in the story. Often it is used to mean something simpler: a character is “developed” in the sense that their (unchanged) nature is revealed to the audience. The character who undergoes real growth is, of course Houtarou Oreki, whose nature has changed so much from the beginning of the series that both Satoshi Fukube and Mayaka Ibara have a good laugh at him during this arc. Eru Chitanda also grows a bit, as she learns something about herself in the course of this arc, but I was very glad to see Satoshi and Mayaka were filled out as characters. Satoshi Fukube — databases have feelings, too. It was particularly interesting seeing how Satoshi’s and Mayaka’s stories were thematically linked. The link is directly related to the mystery of the arc, so I won’t say much more than that several people have to feel the frustration of acknowledging their own limitations. Something that is particularly painful when others near to us demonstrate skills beyond ours, and then seem content to let those skills (that we secretly covet) go to waste. Houtarou Oreki — much more than a crowd-drawing panda. 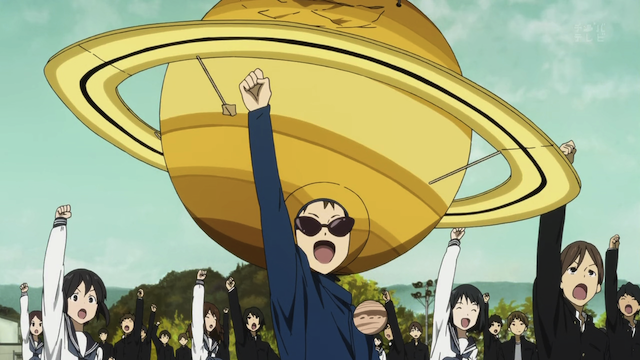 One of the special treats of Hyouka has been the way it has engaged the Mystery genre. It has a very cerebral, and even literary approach. The first arc had a development phase in which each character in the Classics club presented some research and a theory that was discussed (and ultimately refuted) by the other members. The elevation of reasoning was (to me) a particularly interesting part of the show. The second arc included similar methodical reasoning, but it also included specific callouts to classic Mystery literature and also rules about Mystery writing (e.g. Father Knox’s Decalogue). The third arc layers on more specific allusions to classics of the Mystery genre (in particular Agatha Christie), and also specific “rules” for solving a Mystery (the need for an association between the victims, or a slip-up by the criminal is discussed at one point). I also want to point out, for anybody who has not kept up with the show: watching the first episode of this series will give you a warped perspective on its nature. The first episode covers two “mysteries”, but their purpose was really to introduce the setting and characters. Three mysteries are solved in the first two episodes, so it might seem that the show has very small mysteries that are resolved quickly, and is very episodic. This third arc took place over 5 episodes, however. There are a couple of mini-mysteries used as transitions, but the real arcs themselves are much more involved, and usually involve a reversal of some sort before they are completed. Hyouka is one of the most refined Mystery genre series I have watched. It has peerless visual presentation. The characters are far from cliché. It is well worth watching, and will easily end up on a Best of 2012 list at the end of the year. They really have done a great job with everything in this series. One of the things I’ve enjoyed the most is the use of visual metaphors and symbolism. They do it subtly, like with the heart shaped pendulum in the cafe in episode three, and they do it blatantly as with the first time Oreki is on the receiving end of a point blank blast of “Chitanda Power * “. It’s also well done in the new opening and ending animations, with the opening doing a superb job of getting to the heart of Oreki’s character and growth. The ending is fun, playful, and fully in keeping with a group of teens; it’s also rather cute, to be honest. All the growth and development for all the characters has been a real pleasure to see, even the ‘not-so-nice’ stuff like the envy/jealousy. I’m still rather surprised at the occasional unflinching depiction of high school in Japan. You rarely see such casual (and unpunished) bullying in anime. Mayaka’s part of this arc in particular was rather blunt about it, especially the way those that should be in charge or with some authority ignore it, and the victim doesn’t say anything to ‘avoid causing trouble’. Most anime either ignore these rampant problems in real life high schools, or they’ll have the protagonists swoop in to the rescue. Hyouka doesn’t and that impresses me. regarding “enchanted”: That is a good description of Oreki’s situation. Notably he even acknowledges it to others. 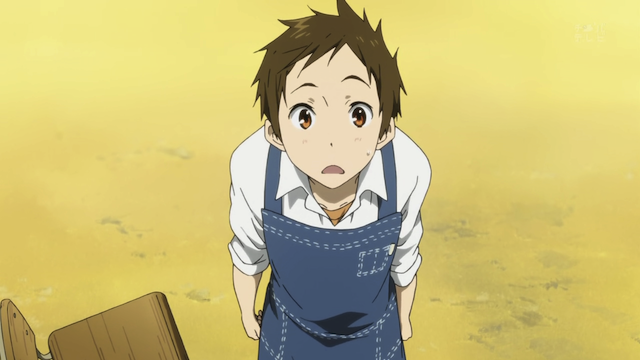 At one point Mayaka asks him, “Why don’t you just say no?”, and he says simply that he can’t refuse her. I’ll have to check that AMV out. This arc was just so captivating from start to finish and the thematic aspects you mentioned were a big part of what made the end so satisfying as the seeds the screenwriters sowed finally bears fruit. Nothing felt unnatural because the revelations fit the missing puzzle pieces within those mysteries. Moreover, the way it engaged my emotions were solid and having gone up against people who have that natural talent, it can be a frustrating affair, making the characters easier to empathize and identify with. I do hope the next arc gives us more thrilling mysteries that not only pique our curiosities, but develops the characters even further. Something I didn’t really get into above was the way that there were layers of people admiring what others could do so easily. Just as person B looked on at person A, there was a person C looking at person B, and so on. As much as the story was about the harsh reality of talents not being distributed evenly, it was also about them being distributed more broadly than we realize.